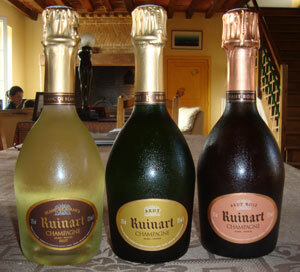 Ruinart makes very elegant Champagnes that are dominated by Chardonnay. "Chardonnay is the soul of the house," as they say. They are the oldest established Champagne house as well, founded in 1729 in Reims. French law didn't allow shipping bottled wine before 1729, so they couldn't have been officially established earlier. They were bought by Moet and Chandon in 1963, who was consequently bought by LVMH, so consequently they are both are now owned by LVMH. Ruinart currently makes 3 non vintage wines, their standard Brut blend which is 40% Chardonnay, 50 to 55% Pinot Noir, and 5 to 10% Pinot Meunier, their Blanc de blancs which I'm currently drinking as I type, and a Rose which is up to 45% Chardonnay, mostly from the Côte des Blancs, and Pinot Noir from the Montagne de Reims and Vallée de la Marne. They also make two celebrated vintage prestige cuvees, the Dom Ruinart which is a Blanc de blanc and Dom Ruinart Rose. The 1998 Dom Ruinart as an example is comprised of 66% Grands Cru Chardonnay grapes from the Côte des Blancs and 34% from the northern slopes of the Montagne de Reims. Even their Dom Ruinart Rose is mostly Chardonnay, up to 80+ percent, and could almost be called a Rose Blanc de blancs if such a thing existed. Chardonnay requires aging and their NV wines age for up to 3 years in their cellars and their prestige cuvee, Dom Ruinart, 9 or 10 years. Nose: clean and clear, light apples, some sweat which I often find in Chardonnay based wines and not at all off putting. Palate: light and frolicky (is that a word? ), slightly tart apples. Nicely balanced between tart (acidic) and sweet. Despite being a NV, this will age and improve at least for a couple of years I'm sure. Excellent balance, length, and persistence! This just got better and better as it warmed. This had a very light straw color. The nose was expansive, with yeasty bread and maybe a touch of exotic white fruits - lychee came to mind. "Blanc de blancs," Pierre, the Champagne Poodle, definitively announced upon nosing this, as he inquisitively raised an eyebrow Spock style. He was in fact right on as although it is not a Blanc de blancs it is heavily Chardonnay dominated. The palate did not disappoint, as it was bubbly, sweet, and smooth - elegant one can say, with applesauce and some quince. A wonderful NV. A light copper salmon hue. The nose is quite delicate, with small pink flowers and a hint of orange marmalade. The palate is light, delicate and very feminine. This seems like Chardonnay, with a touch of Pinot, which is precisely what it is. Overall it's a very elegant and feminine rose.